When we first launched Signing Savvy we used PayPal for all of our payment processing. PayPal is one of the most trusted methods of transferring money on the Internet. However, we have had several users ask if they could pay directly for membership without having a PayPal account. Good news! We now accept credit card payments directly through the Signing Savvy website! That is, you can pay without using PayPal. Of course, if you prefer to pay with PayPal, you may still do so. Membership gives you access to all the features of the Signing Savvy website. Become a member today! I am a ASL student. I am going on my 5th week in school. I needed something besides a book to show me signs. Its hard to tell on paper how to sign so I joined this and its awesome! I have twin daughters who are deaf and they love this site. Thanks again! I like your site and how fast and easy it is to use. Thank you. Would be really cool to have an index by hand shape, as in the book The American Sign Language Handshape Dictionary. We now have a RSS feed (What is RSS?) of the Signing Savvy blog. Feel free to link to it in your RSS readers or pull the feed into your own site. I think you are doing a great job - I LOVE the site! 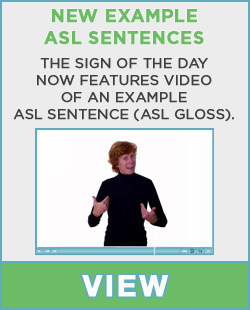 It has helped me soooo much in learning college level ASL. I paid for the membership and it has been very worthwhile. I highly recommend it. Sign of the Day RSS feed? We don't have an RSS feed for the SOTD, but as a Member, you can access the Sign of the Day Word List and see past sign of the days. Today we enhanced the member ability to create word lists. Previously, once you created a word list, you could add words to the word list by searching for them and then selected your word list from the Add to Word list drop down menu on the page of the sign you wanted to add. While this feature still remains, there is now a much easier way to add words to your word list. You can now add a whole list of words instantly to your word list! Find the word list you want to add words to and click the Manage Word List button next to the list. If you don't have a word lists yet or want to create a new one, just click the Create Word List button. On the Mange Word List page, just type (or copy and paste) the words or phrases you wish to add to the list into the Add Words text box. Put each word or phrase on a new line. Words on the same line will be treated as a phrase. Then click the Add Words button. You will be given a report of what was added to the word list. Once you return to the Manage Word list page, you edit the word list, including choosing a variation for words that have multiple meanings or multiple sign variations, removing a word, changing the word order, or modifying a phrase. As always, any word list you create you can share with other Signing Savvy members. You can also practice the signs on the word list using the virtual flash cards feature or quiz yourself using the quiz feature. Enjoy the new word list features! The lists are great! Thank you so much. I, too, was looking for lists for signs listed by handshapes a la The American Sign Language Handshape Dictionary, by Tennant & Gluszak Brown -- or a handshape index for the signs on Signing Savvy. Anyway SS would think of including such an index or lists? Thanks once again for this excellent resource! We have had word lists since the launch of Signing Savvy. However, we have made a number of improvements recently that greatly enhances word lists. We are really excited to announce the added functionality that allows you to test your signing skills with our new virtual flash cards and quizzing features within word lists. The word list features are explained below. Word lists are usually semantically related signs grouped together. For example, there are a number of Signing Savvy created word lists, such as Colors, Animals, and U.S. States. Many of these word lists are available from the "Browse Signs" box in the top right side of the web page. So far our members have created over 1000 of their own word lists! As a member, you can create, view, and manage your word lists by clicking on My Word Lists in the "Browse Signs" box. Members can choose to share their word lists with other members on Signing Savvy. For members creating word lists, this is a great way to share your favorite signs with your fellow students, classmate, friends, or family members. For all members, using Shared Word Lists is another great way to explore and learn signs on Signing Savvy. One of the new word list features is virtual flash cards! This feature allows you to use word lists to practice your signing. You can view the sign, think about what you think the sign is for, and then reveal the answer to see if you are correct. You can also do the opposite. That is, you can view a word or phrase, then make the sign (perhaps using a mirror so you can see yourself sign), then reveal the sign video to see if you are correct. Just like paper flash cards ... but with benefits of video! You need to be a member to use this feature. However, you can preview flash cards on the color word list to see how it works without being a member. Another new word list feature is the ability to create a quiz from the word list and then test your knowledge by running through a series of multiple choice questions. What better way to practice your signing or to prepare for an upcoming test than to quiz yourself from the comfort of your own computer. You need to be a member to use this feature. However, you can preview quizzing on the color word list to see how it works without being a member. The "View All Signs Together" feature allows you to view all the signs in the word list, back to back, in one video playback. This feature is also quite useful for printing the entire word list at one time using the PRINT signs feature. These are great, but I wish you could do this without having to scroll down after each card/question to see the new sign. It would be nice to just be able to see the sign and immediately be able to answer it. I like the setup as I can adjust my monitor view so that I do not see the possible answers. As the "instructor" is signing, I say the sign then scroll down to select my answer. If my answer is not one of the choices, I now have a hint and I create a "refresher needed" list. We just added the feature so you can minimize the site header while going through the flash cards or quiz. This should make it so you do not have to scroll down. When using the flash cards, it would be nice for the "Reveal answer" and "Show next" buttons to have focus and the same position on the screen. That way, I could go through the cards faster and without needing the mouse.